Many of us will remember our parents telling us that the secret to making short work of a tough job was to always have the right tool at hand to do the job. 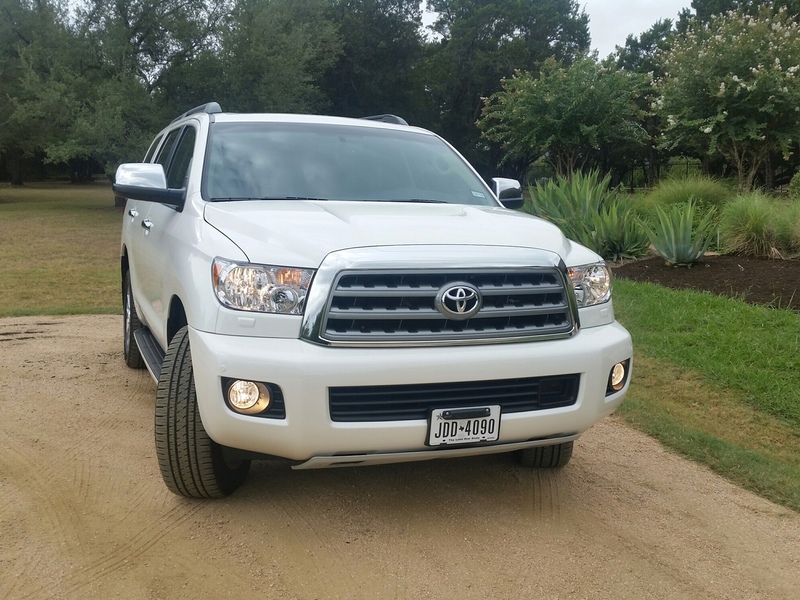 Always mindful of that advice, we found our ride and drive-test 2017 Toyota Sequoia Platinum 4x4 SUV to be just the right tool to get us safely to the Austin airport during a very ugly storm situation early one morning this week. As we answered the alarm clock at 4:45 am to load up for our “normal” 35 -minute run to catch an early morning flight, it was dark – not just dark but seriously dark such that we could not see across the street. Very quickly we realized that the ‘dark’ was going to be the least of our problem as an unseasonably ugly storm had engulfed us bringing high winds, wicked lightning and rain – lots and lots of rain – making the dark night even darker. A quick check of the Weather channel radar showed us that the storm stretched all the way to the airport and was expected to be stalled over the area for a while. Now out where we live, lots and lots of rain means heavy water on road surfaces that can run fast across and fill low spots along our country roads making them dangerous. Adding the early morning dark factor, a trip to the airport was going to be a major challenge. Given those conditions, we might have considered not going if we were going to drive our small convertible coupe. 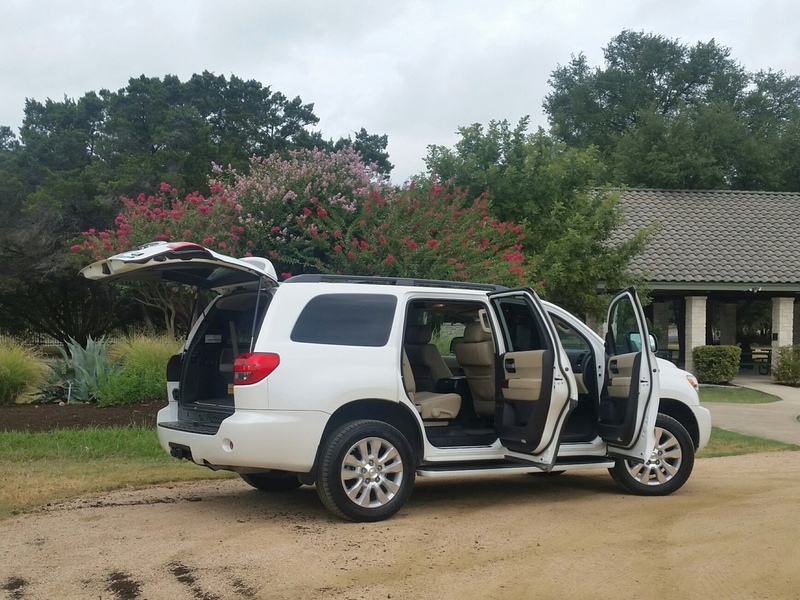 However, with the test Sequoia available in the driveway, we opted for the SUV knowing it was the ‘right tool’ with an ideal set of features and equipment that would turn the very nasty morning journey into nearly a cakewalk. Getting into the Sequoia in the dark with the driving rain was the first challenge. Clicking the key fob, we turned on the approach lighting as we remotely unlocked the doors and opened the rear hatch for quick access. The puddle lights under the mirrors allowed us to see – and avoid stepping in – the rushing waters in the gutters as stepped onto the side rails to get in. 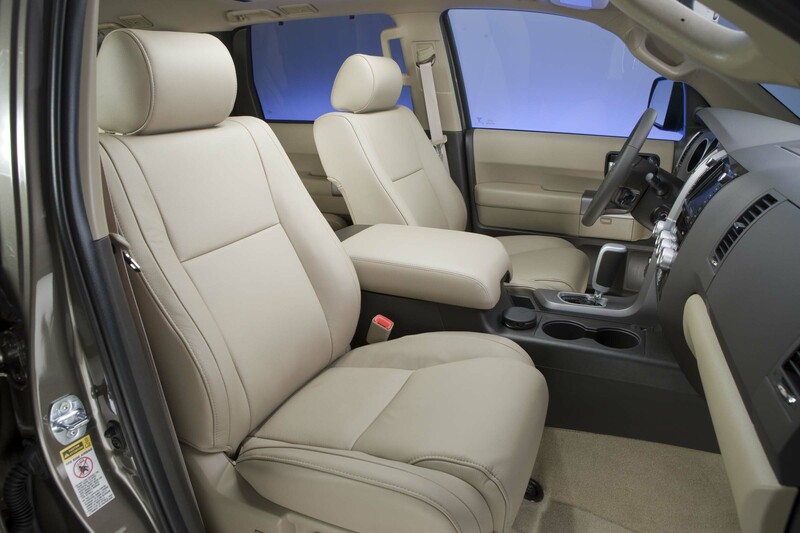 As a full-size body-on-frame SUV, the driver 8-way adjustable seating is easily adjusted to a ‘command position’ height for good visibility. 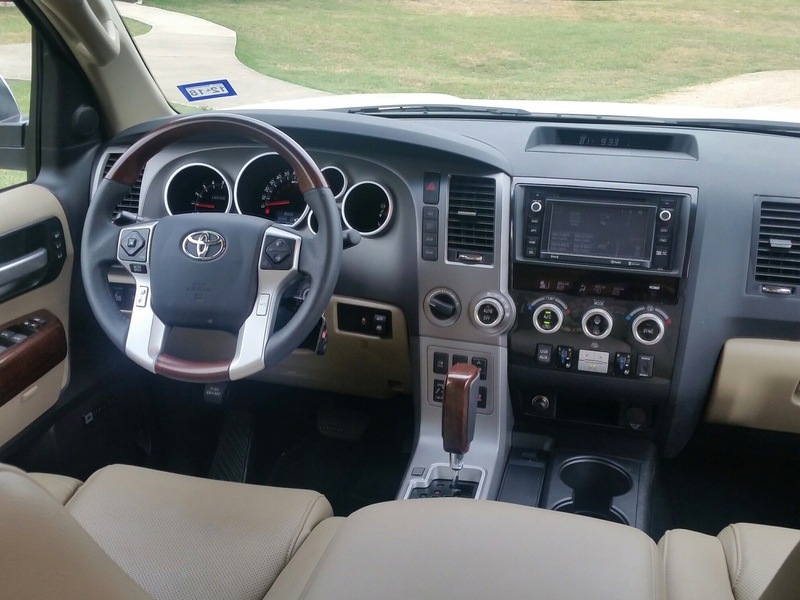 The Sequoia’s windows – windshield, side windows (all three rows) and rear hatch are expansive without obstruction and give plenty of visibility in all directions. The design and placement of the rear hatch window with spoiler above – unlike other competing SUV’s – keep the rear glass clean at all times without the need to use the rear wiper. The front intermittent and variable speed windshield wipers keep an optimal amount of front glass cleanly swept with ease. The generously sized towing mirrors provide a clear look at the side of the Sequoia and, coupled with the Blindside Warning indicators in the mirror, present a clear picture of traffic alongside. Large and boldly lit taillights augmented with the LED rear spoiler-mounted stop light keep Sequoia fully visible to traffic following. And, lastly the multi-reflector halogen headlamps with integrated fog lights give good visibility to the road surface to the front. 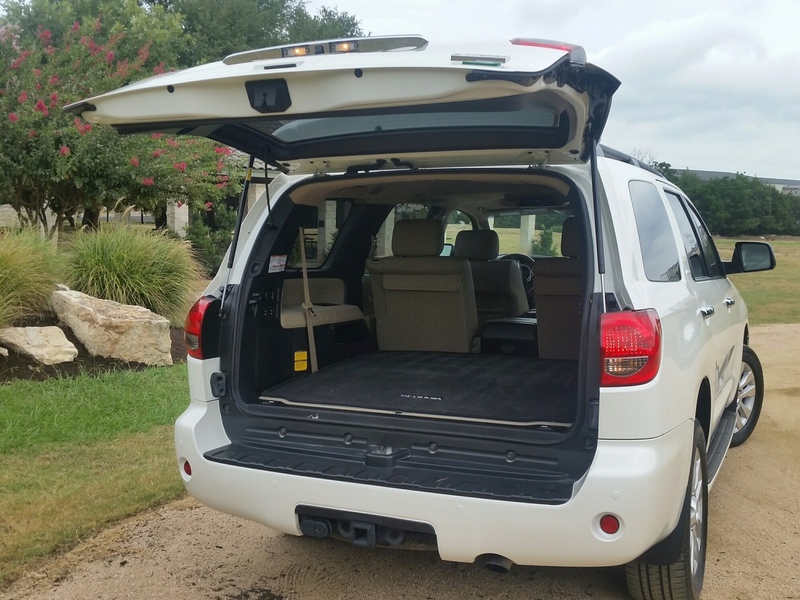 We found the 6,000-pound 2017 Sequoia Platinum 4x4 to be mechanically up to the task as well powered by the solid performing 5.7L i-Force V8 that delivers 381 horsepower and 401 lb.-ft. of torque. Mated to a 6-speed Electronic Controlled Automatic transmission, its gearing is well suited to push this full-size SUV through – and not over – wet road surfaces. Standard road clearance height of the Sequoia is a full 9.6-inches keeping rushing water on the road surface safely away from the cabin and powertrain elements. Sequoia runs on 20-inch diamond-cut alloy finish wheels mounted with P275/55R20 M&S rated tires that cut solidly through water while holding the road surface well. Engine speed-sensing Variable Flow Control power-assisted rack and pinion steering easily controls direction. ABS Brakes with Brake Assist and Electronic Brake-force Distribution featuring 13.9-inch front and 13.6-inch ventilated brake discs, give solid stopping power in wet conditions. 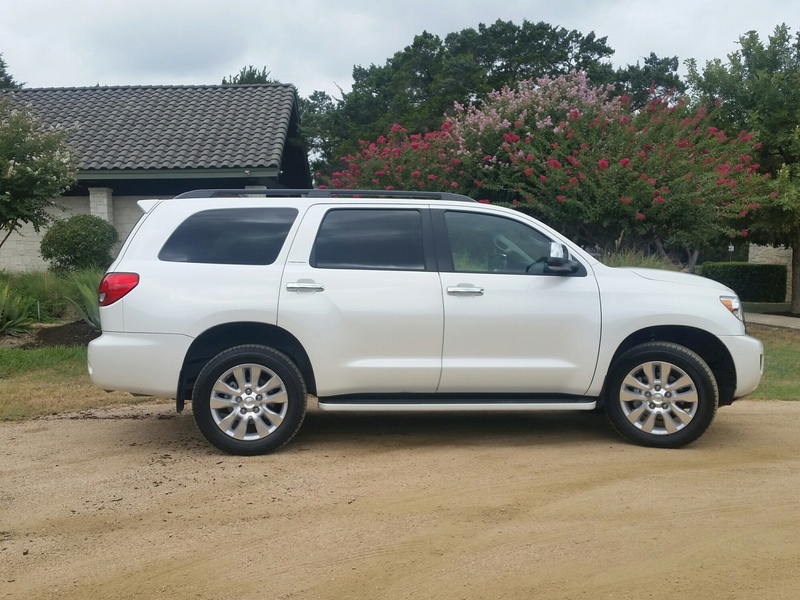 More serious weather conditions like more than a couple inches of water and/or mud on the road, would have been short work for the 4WD equipped Sequoia by, if needed, by shifting to 4-Wheel HIGH engaging all four wheels for additional traction and pushing power. 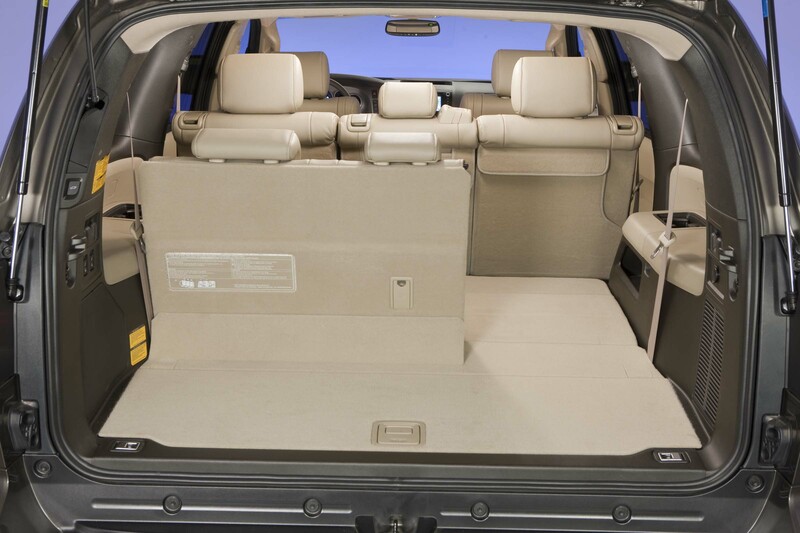 Lastly, Sequoia is also equipped with the Electronically Modulated Air Suspension (HIGH/NORMAL/LOW) that. 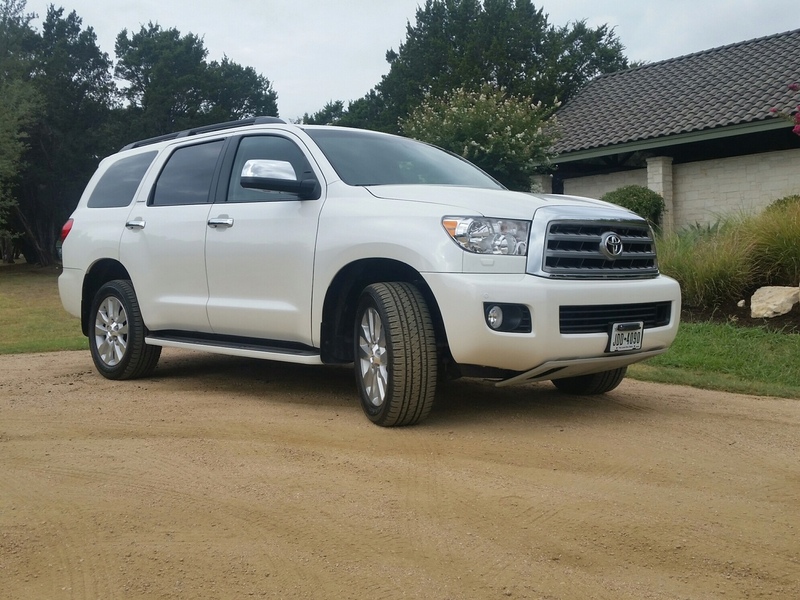 when presented with deeper water or mud, the driver can shift the ride height to HIGH adding 1.2-inches to ground clearance making it 10.8-inches if needed. From a safety perspective – please note we were not doing the ‘cowboy’ thing that morning. We know these roads well and in an abundance of caution, kept our speed down and watched carefully along the route for low spots with rushing water or mud that could have been trouble. Keeping in mind the “turn around and don’t drown” mantra, flash-flooding had not been forecasted, but we remained vigilant the entire journey taking nearly 75-minutes to get safely to the airport.